Feast of Saint George the Great Martyr, "Giorgoba". 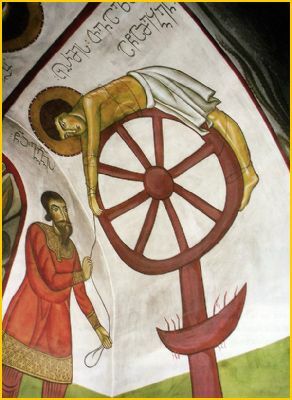 November 23 in Georgia is a public holiday, to allow people to celebrate the Feast of the Martyrdom of Saint George. 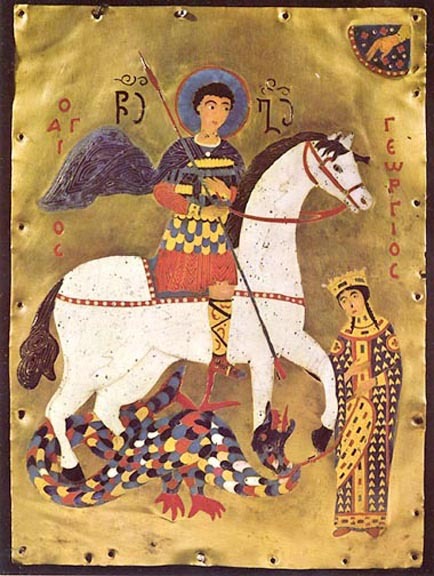 The two saints most honoured in Georgian society are Saint George and Saint Nino. According to tradition, they were cousins. Both born in Cappadocia in Anatolia, their family backgrounds were possibly Greek. Saint George was born into a military family. His father died young, and his widow, originally from Lydda in Palestine, returned to her hometown to raise her children. Her son George was raised as a pious Christian and was well-educated. The youth followed his father’s example in joining the army soon after his coming of age. His father had been on close terms with the Emperor Diocletian and he was readily accepted by the Emperor. He proved to be a charismatic soldier and consequently rose quickly through the military ranks of the time. By his late twenties he had gained the titles of tribunus (tribune) and later comes (count). By that time George had been stationed in Nicomedia (near Constantinople, on the Asian side of the Bosphorus) as a member of the personal guard attached to Roman Emperor Diocletian (reign 284–305). In 303, Diocletian issued an edict authorising the systematic persecution of Christians across the Empire. His caesar, Galerius, was supposedly responsible for this decision and would continue the persecution during his own reign (305–311). It is believed that George was ordered to take part in the persecution but instead confessed to being a Christian himself and criticised the imperial decision. Diocletian offered him money, slaves and property to renounce his faith but he refused. An enraged Diocletian proceeded in ordering the torture of this apparent traitor and his execution. After innumerable forms of torture, George was executed by decapitation in front of Nicomedia’s defensive wall on April 23, 303. The witness of his suffering convinced Empress Alexandra and Athanasius, a pagan priest, to also become Christians, and so they also joined George in martyrdom as consequence. George’s body was then returned to Lydda for burial, where Christians soon came to honour George as a martyr. 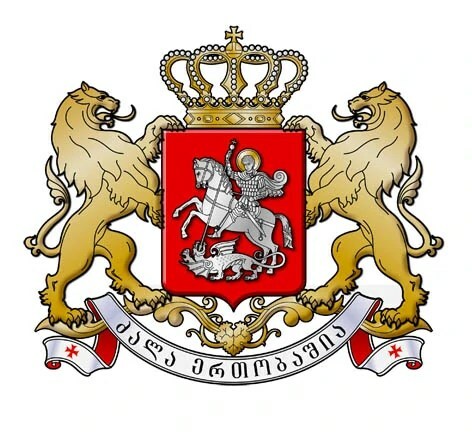 Many people believe the foreign name for this country, “Georgia”, to be related to the name of Saint George. 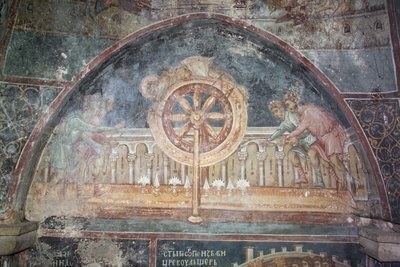 The reality may be different; in Greek, “giorgos” is a farmer, and the Greeks had extensive contact with Georgian tribes up to 3000 years ago. Various ancient Greek writers described Georgia as a fertile and prosperous land with well-developed agriculture, so it may be that “Georgia” simply means “The Land of Farmers”. 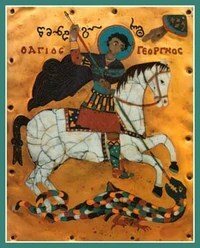 Nonetheless, Saint George’s tremendous popularity and significance for Georgian people still needs to be explained. His close family relationship with Saint Nino of Cappadocia, the Enlightener of the Georgians, may explain part of his appeal. Saint Nino, considered of equal status to the Apostles in Georgia, established the tradition of commemorating his martyrdom. His background as a courageous and honourable soldier likewise would attract respect from the martial Georgians, who view themselves as a race of warriors. He is reported to have appeared to Georgian troops many times over the centuries before crucial battles, and has a special place in the heart of Georgian servicemen. He is usually portrayed in icons as a young soldier in armour, or astride a white horse doing battle with a dragon. 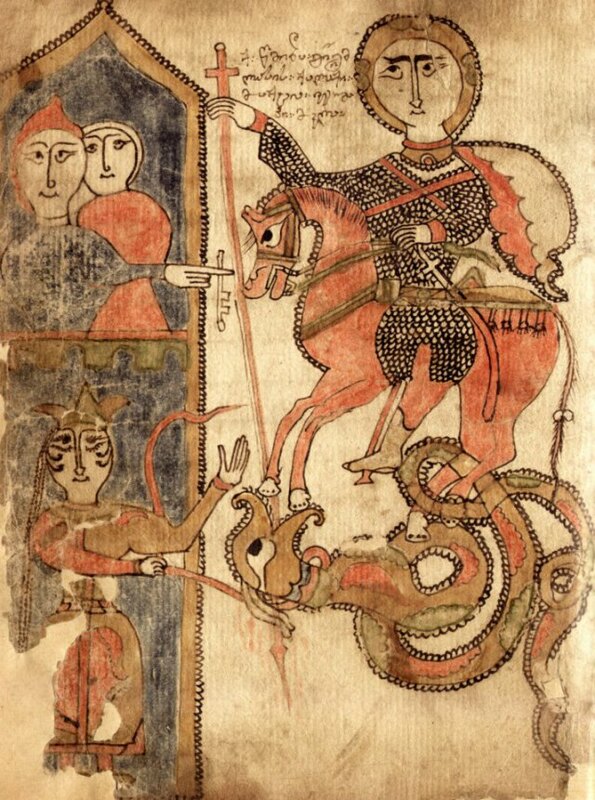 While the familiar tales of Saint George slaying the dragon may be mythical, the iconography draws very strong parallels between Saint George, the warrior-saint, and Saint Michael, the Commander of the Heavenly Host. Saint Michael is often portrayed mounted on a horse doing battle with a serpent, which represents Satan. So to an extent Saint George and Saint Michael are closely identified as warriors doing battle with evil.